2/14/09: Because this episode was pre-empted on 2/9 by President Obama, it has been rescheduled for 2/23/09 after episode 214 ("Chuck vs. the Suburbs"). Sarah with her now familiar gun-toting pose, but the outfit is new. Chuck reacts to something he's seen. Chuck doing his spy thing as he attempts to take pictures. 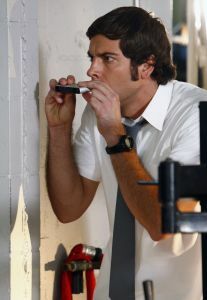 Chuck hides from Anna's new boyfriend and his gang.